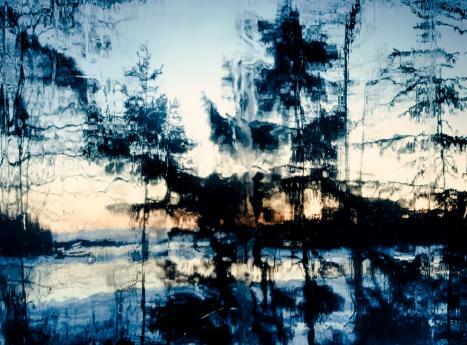 Attributed to the Helsinki School, his photographs reflect both his interest in the specificity of photography, the beauty of landscape and his love for art history. Jorma Puranen’s experimental photographic works address the question of reality and artistic representation by generating disorientation and distance in front of the image. In his “Shadows” series, the aura of photography brings the classic paintings to life by creating moments of aesthetic pleasure that take us into his world of reflections and shadows beyond objectivity. His plastic and photographic reflections on landscape and historical portraiture take us into a particular universe where the here and now is sublimated by the magic of photography. Through the play of temporality and spatial interval, Puranen creates tensions between the past and the present that are symbolised by the immanence of the flashes of photographic light and the permanence of the pictorial patina. Here, the artist’s subjectivity meets that of the viewer in a kind of intersubjectivity that allows us to say with Steven Bernas that “photography is not the place of the representative but the place of the sensitive”.